AIM Reusable PackagingFixed Wall Plastic Bulk containers are built to meet the most rigorous demands in industrial, food processing, and agricultural applications. 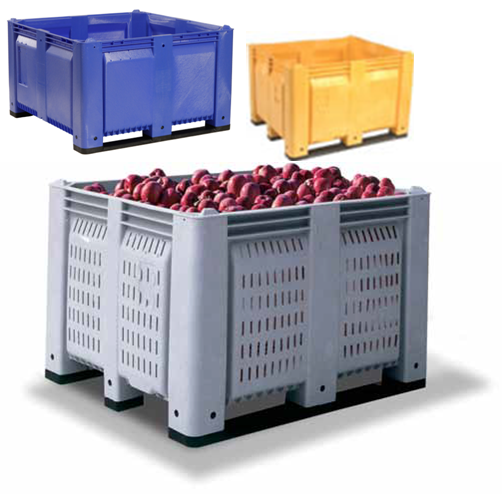 These high-impact resistant HDPE structural foam, fixed wall containers are rugged and recyclable. They meet FDA/USDA standards for food handling, and can be steam cleaned. AIM Reusable Packaging containers are temperature resistant, UV resistant, and can be stacked up to 10 high. They also offer compact storage, a versatile runner design, and are available in a variety of colors.Standard Footprint: 48”x 40” & 48”x48” – various heights. Standard. Other sizes available.